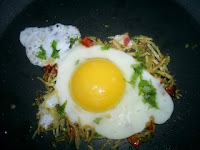 I have always loved egg yolks or deemer holudh (egg yellow) as I would call them as a kid. Now, if you noticed, I have written a lot of this post in the past tense. And that's because there seems to be no place for egg yellow in the racist world of good health. Why racist? Well doctors and dietitians have this 'whites only' policy when it comes to eggs. Apparently egg yellow is fattening and, more importantly, bad for cholesterol. Egg whites are apparently protein rich, filling, they do not up your cholesterol scores AND are frigging tasteless. Try having an egg white omelet with its needy, cloyee, insipid taste. It gets stuck in your teeth as it it quite brittle. Or try doing what I have tried to do bravely for the last few mornings - have chopped boiled eggs with tomato, pepper etc or worse still and egg white brown bread sandwich. Torrid! I chanced upon an episode of Nigella Cooks on telly the other day. Nigella Lawson was making a dessert where she, listen to this, strained out the egg whites and used only the yolks!!! What a woman. now you tell me that you hate my boiled egg white salad recipe!!!!! I'm with you all the way!! Yolks, especially runny ones are the bomb! In the winter, my favorite breakfast is a runny over-easy egg on top of oatmeal. Similar experience with eggs except mine were during hostel days when eggs were the main stay of the food chain. Over the years they have become a comfort food and the weekend has to start with a good egg based breakfast, which I cant have during the week.